I have had a lingering cold for the last week and it's gone from being something I could ignore to making sure I have massive amounts of Kleenex for my nose. This means that I've been bailing on exercise. I bailed yesterday when I needed to get a run in but my body was just too tired. 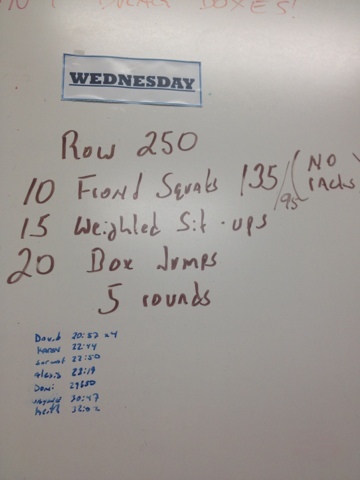 I felt better this morning so I went to Forged Fitness and did the WOD with Karen. No one else showed up, I think everyone was afraid of a workout the day before the Fight Gone Bad charity event. But I checked the WOD before leaving home and saw that it was only running and burpees so I knew Jason was thinking of us and making sure we would not be worn out before Fight Gone Bad and we would still get a decent high-intenstiy workout in. The first set of burpees squeezed all the energy out of me and it took some coaxing to get my legs to go faster during the second lap. All in all, a pretty good workout that left me feeling energetic and I'm pretty sure I won't be sore tomorrow from it during Fight Gone Bad. What is Fight Gone Bad? It is one of the benchmark Crossfit workouts, I will definitely be posting pictures/video of the event and am raising money for NC Autism Society. The raising money part has not been much of an effort as I only got organized this week to ask people but I did get a few donations in and am happy to be able to raise any money at all since my scores in Fight Gone Bad are nothing to brag about! I took today off so I will also be doing a little mountain biking today! My back felt much better this morning, I guess it was just really, really sore. My double unders are non-existent, so it was trying to do a double-under 6 times and then doing the 3x the amount of singles to finish. I can do toes to bars but after the first round, my toes to bars looked like toes to chest level. It was a tough workout, I still feel a little tired from Sunday's long run but glad I went! I felt okay but my back was still feeling achy and sore from the 24 miles of running on Sunday. Luckily, it rained today so no mountain biking! I didn't do anything on Friday and Saturday because I had a cold (feeling tired, sore throat) so I backed off on the cardio. I did however, try bench pressing again Saturday night and got 95 lbs and 100 lbs with a pinky assist. I can't wait to break the 100 lb mark! You get many congratulations when you finally do break the 100 lb mark, and it feels good. I still remember when I was able to front squat 100 lbs and the words of encouragement I got from my fellow gym-mates. I was beaming! But Sunday rolled along and it was time to do the last long run- 24 miles prescribed. I met up with Jim, Lisa, Barabara and Barbara's two running buddies Kurt and Brian. 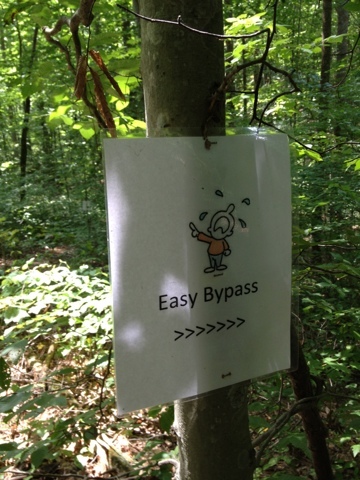 We didn't know exactly what path we were going to take but it was at Umstead and we planned to do our first foray into Schneck Forest. The weather had cooled down and we got rained on and had a very wet run. 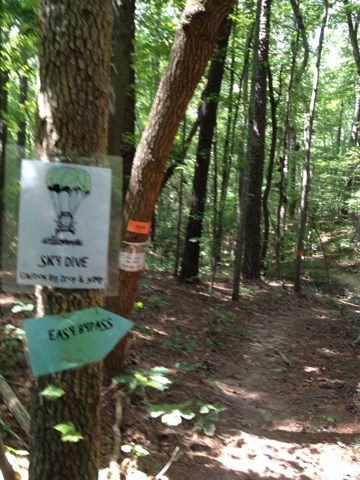 Nonetheless, it was nice to be on a new piece of single track and when we got back onto the bridle trails at Umstead, we had about 8 miles done. Jim was lagging behind because of his ankle hurting and I started to feel like my legs were done after 10-11 miles so I called him and decided to bail with him. The walk back to the car was LONG, but even the amount we walked counts toward our mileage! Of course Garmin miles and Strava miles differed by a mile- 13.7 versus 14.8 miles. I like the extra mileage on Strava but who knows? We bailed on a 24 mile run and still got 13-14 miles done with 11 of those miles running. My feet felt tender and sore. I still had my 16 oz of chocolate milk and then had a lunch of leftovers (grilled chicken, cheese bread and 1/4 of a steak & cheese calzone). Post-lunch, I got my eyes examined because I needed new contacts and the ophthalmologist told me I had some eye allergies (there was redness/orange veiny-ness. I had though my contacts were just getting old but maybe I do have some allergy to something, anyway she recommended a spray antihistamine which I will try out. I got home and watched too many episodes of Wilfred (too funny) and then fell asleep. I woke around 4:50 and decided that I needed to go out and run again otherwise I would regret not getting in 24 miles today. So I laced up again, got the Garmin on and Strava on and headed out with my Nathan's pack still full of watered down Gatorade. 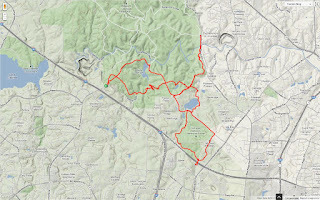 I took the greenway and decided to try a loop that would take me on Old Reedy Creek rd (bridle trail in Umstead) then Reedy creek Lake trail and back on Harrison avenue to get home. I got about 10 miles (Strava changed it's mind, first it said I did 10.2 but then when I hit "finish run", it said I only did 9.8 miles so we are going to round to 10 miles!). My Garmin missed the first two miles but had accumulated 22 miles so I think it's safe to say I got 24 miles in today. It took two separate runs but I did it! My legs still felt slow and heavy but I needed to run. I had planned for 24 miles on Sunday and there was no way that was going to happen if I didn't run during the week. So I gathered up my energy and headed out for the greenway. I hooked up to the Lake Trail (Crabtree park) and looped back to get 9.4 miles at the incredibly slow pace of 13:30 min/mile. By the time I got back on the greenway, the sun was setting and I had to get off the dark trails (otherwise I step on a frog or a snake!). I ended up taking an exit of the trails towards what I thought was my neighborhood but was actually the ritzy neighborhood adjacent and then going in the wrong direction. I finally realized that I should check out a map on my phone and turned out around and got back home okay. This puts me at 57 miles of running since September 1st, my goal was to get to 100 miles accumulated by September 16th but that does not look like it's going to happen. I got a sore throat and was feeling tired Friday and Saturday and just trying to recover for our long run on Sunday. It was too ambitious but I am glad I tried! This was a bit harder than I expected. 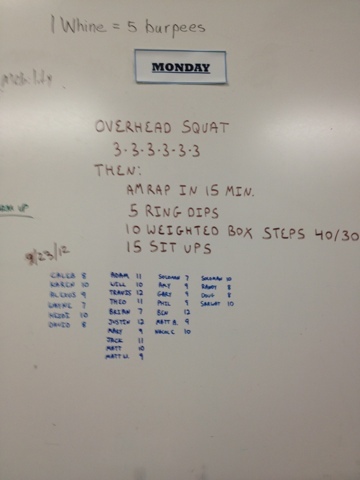 I got the 15 thrusters done in under a minute but then had to break up the toes to bars to do burpees. 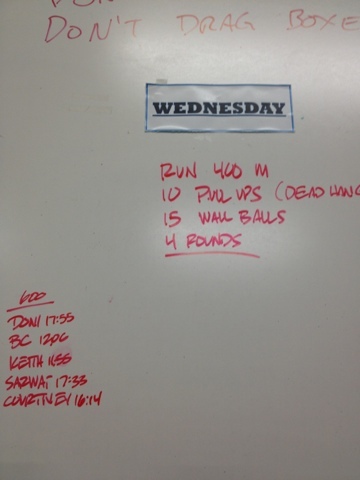 The only exercise I finished in under a minute both rounds were the kettlebell swings. And my legs were sore afterwards! 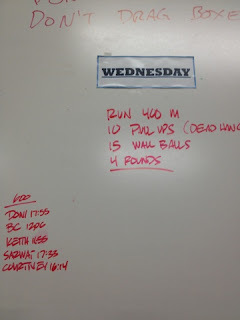 The mini-WOD is to prepare us for the Fight Gone Bad workout which is going to happen on September 22nd. We are going to raise money for the NC Autism society. It looks like this year the official Fight Gone Bad workout that raises money for the Wounded Warrior project had a tiff with Crossfit headquarters and they have gone their separate ways (lawsuits tend to do that). I am glad I at least got to do FGB last year "officially" but this year, it will be a homegrown charity fundraising event and not part of a national effort. I hate that two behemoths couldn't work something out because it feels like the whole importance of the event (helping soldiers and their families) was irrelevant to both parties, and I believe it was irrelevant to them because they were willing to burn down the Fight Gone Bad name in order for one party to "win". What the hell there is to win for a non-profit is still something I can't figure out yet. But it's not the worst thing that has happened this year so we will move on and have our own little charity event to help autistic kids which is a cause I can definitely support. 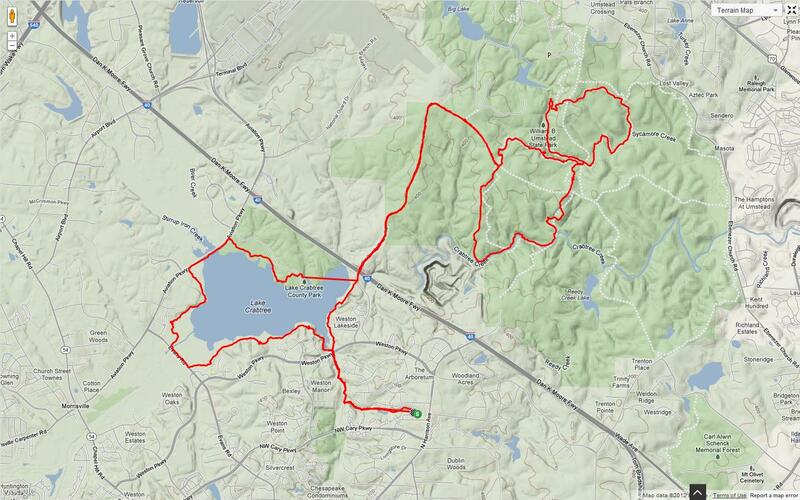 Post-work, I went to Lake Crabtree to run and bike. 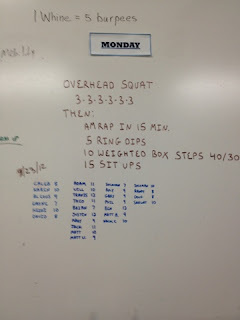 The run never happened, my quads were feeling pretty tired (from the back squats?) so I just did a short bike lap and then met up with the other women for the Tuesday night girls' ride. We did about 9 miles. It was a good time, the weather was perfect and after it was over, so many of the women stayed a little longer to chat! I loved it, and am going to miss it now that the sun is setting earlier and we are going to have end these rides until spring. I did not do a Crossfit WOD this morning so I had plenty of time to do a run. I got home early (because I went to work early) and thought I'd be able to do a leisurely paced 10 miles. My motivation was low and I wasted time at home not doing much. I finally looked at the clock and decided that I would change and at least try to run 4 miles. I set up my phone to Strava and put on my Garmin watch and got out the Nathan's pack full of water. The Garmin kept searching for the gps, it searched for the freaking gps for 90% of my actual run!!!! That was aggravating. I don't understand how my phone can have a gps signal so easily and my Garmin took over 60 minutes to find a satellite. I ran from my house to the greenway, made a left on the Black Creek Greenway until it hit the street and turned back. On the way back, a runner going in the opposite direction warned me that there was a snake up ahead. 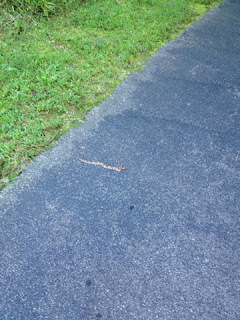 I forgot to mention this but last week, on the same greenway, another runner warned me that there was a copperhead up ahead. I ran gingerly and kept my eyes peeled but never saw the snake last week. This week, it was a different story. I saw the snake, I walked by it giving it over two feet of clearance and then I thought, why not take a picture or two? 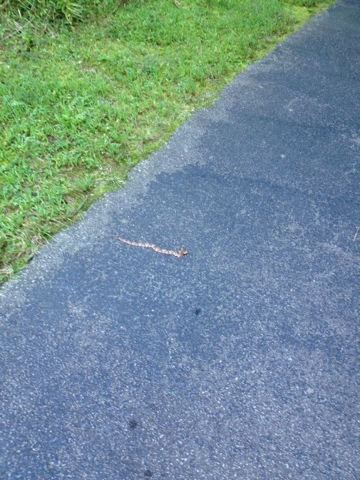 It was a little baby copperhead, it didn't move the entire time I was there (a minute or less). I'm glad I saw it in time, I"m glad I didn't step on it or annoy it, I hope I never annoy one. I ran the whole length of the greenway from where it meets East Dynasty to Old Reedy Creek Road (~ 5 miles) plus the out and back from my house gave me a total of 7 miles. It took me 1 hour and 42 minutes at a 14:37 min/mile pace! My legs felt a little heavy and I don't think I had it in me to run any faster since I did 10 miles yesterday. But I am glad I got out there and did this easy run. Based on my training program, this week's long run was to be only half of the mileage from last week's long run (20 miles). So Lisa, Jim, and I planned to do 10 miles while Barbara wanted to do a little more (I think she did 12). 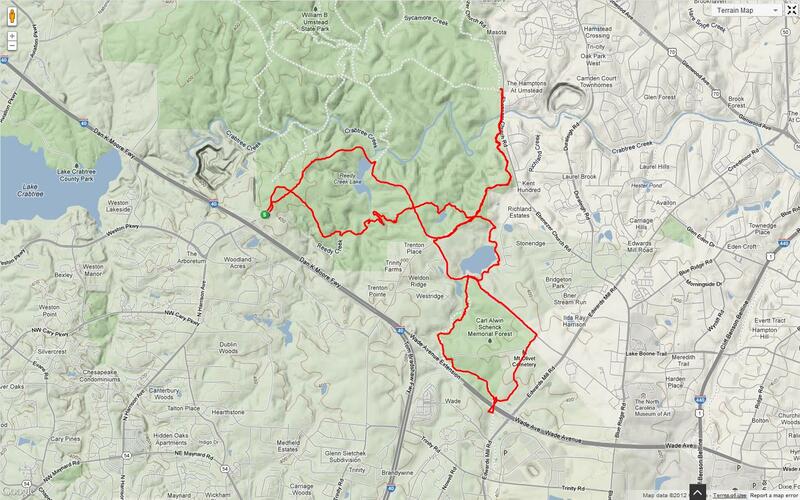 We did a slightly different loop at Umstead: Loblolly to Turkey Creek to Graylyn to Old Reedy Creek to Reedy Creek Lake Trail back to the parking lot. I had a hard time getting started, and am not sure if I am just too slow on the singletrack or I need more time to warm up. Once on the bridle trails, I forced myself to pick up the pace and attacked every hill. Of course, my attacking every hill is still like a > 12 min/mile pace! I ended up doing 10.8 miles in 2 hrs and 8 minutes (11:48 min/mile pace average). It was weird doing a 10 mile run and thinking "wow, what a short run!". Training for a marathon is hard, much harder than I expected. Part of it is getting the commitment to run more, to run enough miles in the week so the long run feels easier. I used to think that two runs during the week would prepare me for a "long run" on the weekend but it hasn't been enough! So I'm working on adding more mileage during the week and making it mindful mileage. So a few very, very easy runs and two "hard runs" that consist of speed intervals or hill repeats. I did a lot on Saturday and all of it at Harris Lake County Park. We had a meetup for a run/bike/kayak. The run was first and we ran the Pennisula Trail (four of us). I had a terrible time the first two miles, I needed to pee and the trail was not the most private. I finally gave in and found a large tree to hide behind. After that, I felt better and continued to run (albeit slowly) when around mile 3, I heard a large insect buzzing around me. I was terrified that it was a yellow jacket or a bee that wanted to sting me so I just bolted. I never ran so hard before! And that damn bee kept chasing me! I never got stung but boy did that give me the adrenalin I needed to make it a tempo run :) I ended up running 5.3 miles total and then changed for the bike portion. There was four fast bikers, me and one older guy who had never been on these trails before. I stuck with the older guy so he wouldn't get lost or hurt (he ended up crashing twice which was unfortunate but something that happens to every newbie!). We biked 7.5 miles, unsure of the time. Then it was lunchtime! Picnic lunch at the park, perfect weather, and perfect company. The last leg of our time at Harris Lake was on the lake kayaking. It's surprising how much you can kayak and still not feel like you didn't go very far. We were out there for over 3 hours and it was a great way to wind down the activities. 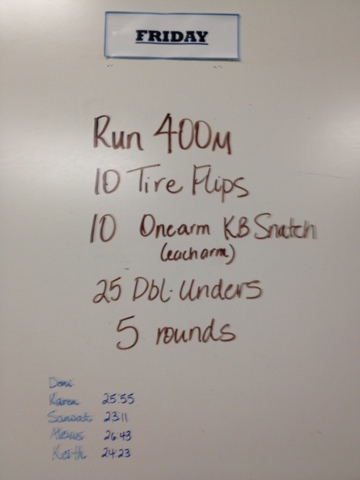 This WOD was suited to my strengths or I just had a great morning because I finished first! I made a strong effort to run the 400M as hard and fast as I could each round. The one armed kettlebell snatches were great for my shoulders and I definitely need to go up in weight next time. 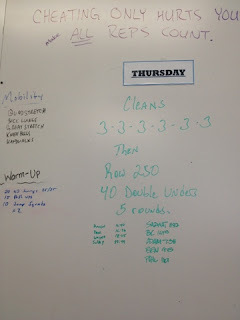 I missed the Thursday morning WOD because I was dead tired and decided to sleep a couple hours extra to recuperate. Then it was thunderstorms in the afternoon so I couldn't go for a hard run, so I decided to go the gym for the 6:30 pm class. I got to 90 lbs on my 1 rep max! It was awesome, I didn't know I could do that much. I'm so excited, I'm going to try 95 lbs this weekend. I did 5 rounds and 100 M run. 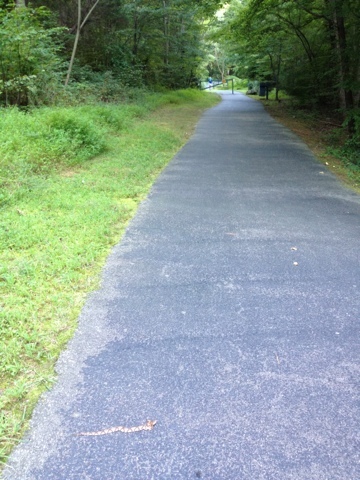 I ran 4.2 miles last night on the greenway behind my house. I had wanted to do 1/4 mile intervals but my Garmin was dead! It was pretty good, about a 11:30 min/mile pace. 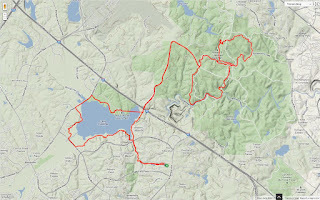 I got to pick the route for the long run this Sunday and I'm happy to say that I actually finished the 20 miles and didn't bail or make a shortcut. We started off at 7:40 am and left from my house and ran on the Black Creek greenway to the Lake Trail and then into Umstead doing the two loops of Sycamore and Company Mill and then back on the greenway to finish. I took a bathroom break at the Lake Crabtree Park (~5 miles) since there are real restrooms there and ate 3 Clif Shot Blocks (100 calories) before starting up again with Lisa and Jim (Barbara was already ahead of us). We caught up to Barbara (or she slowed down to make sure we were going the same way) and got onto Old Reedy Creek road. This was a bridle trail road (wide, dirt road) and ran here until we hooked onto Company mill on the left side. I saw Barbara, Jim and Lisa in the distance (~0.2 miles) while on the bridle trail but didn't try to catch up to them because I wanted to make sure I had enough energy to finish 20 miles (in other words, I was going pretty slow!). At this point though I had finished 9 miles in 2 hours and 11 minutes so it was a little better than my previous 4 mph pace (not by much but an improvement!). I was feeling grateful when I saw the left turn on Company mill because the bridle trail was getting to be tedious. Once on the singletrack, I gained some energy back and started moving with short, quick steps (it felt like I was running at a good clip but Strava tells a different story of a 15 min/mile pace). I hooked a left onto the Sycamore loop and a mile into the loop, I took a break and ate a banana. Yes, this time I brought real food and it was awesome. The whole time I was sipping in my Nuun-flavored water from the Nathan water pak and I really liked not having to hold a bottle in my hand or stop and get a drink. A banana is definitely going to be integral in all future longs runs. After Sycamore was over, I got back on Company mill and met up with Jim, Barbara and Lisa at the bridge that takes us back to Harrison avenue. We didn't cross the bridge though since we were only doing the lollipop part of Comany mill and not the stick. They had stopped because Lisa was stung twice (yellow jackets I think) and she had not taken it very well. We started up again and I ran behind Lisa for the rest of the loop on Company mill. My stomach was rumbling so I ate a pack of Sport Jelly beans. When we came out of the singletrack, we met up with Barbara at the water station on Old Reedy Creek rd. Jim was no where in sight, we lost him on the Company mill trail. I had finished all my water so I drank half a bottle of water using Lisa's water bottle but didn't refill my water pak (mistake) since I figured I wouldn't need to drink anymore with 4 miles to go. We waited a few minutes at the water station hoping he would show up but then it started to rain, it rained hard. We decided to keep on trucking. Barbara and Lisa pulled away from me and after 1.5 miles, I gave up on trying to keep up with them. I was just trying to focus on the fact that I only had about 2.5 miles to go. I said hello to some mountain bikers I knew before getting off of Old Reedy Creek and onto the Black Creek Greenway. Here again, Barbara and Lisa were waiting for me. I told them to keep going and gave them the landmarks that would help guide them back to exit near my neighborhood. They ran ahead of me and I kept up a slow pace. There was another water fountain near my old apartment complex so I drank some water there (again didn't refill since I wanted to not lose too much time!) and kept going. Then I hit a wall, it was mile 19! I had no legs anymore and felt like lying down right there on the greenway. I sat down on the ground for a minute or two and ate my last pack of Sport Jelly beans. I then put one foot in front of the other. Lisa called me and said they weren't sure which way to go. I was about 2 minutes away from them and when I met them, told them we had reached 20 miles and only had 0.6 miles to go. At this point, Barbara sprinted for the finish because she was really hungry and wanted to go home and eat something and Lisa and I walked slowly back up my neighborhood greenway. That last 0.6 miles was the longest ever! Back at my house I gave Lisa my last banana and she left. I then hobbled over to the kitchen, poured myself 16 oz of chocolate milk, collapsed on the carpet and drank my chocolate milk. Jim finally came back maybe 20-30 minutes later. He had walked the last 4 miles, it wasn't the best run for him. Run time: 5 hrs and 35 minutes! Nuun water was good, I had no cramps in my legs and think it was a benefit to have the Nuun in there plus using the hydration pak! For 20 miles, I need 300 calories in sport food and a banana, I possibly need 400 calories but that is up for debate, I definitely should have had the last pack of Jelly beans before I did the last 3 miles. I ran 3 times this week before this long run and that really helped me. I'm going to keep up the program of short slow runs, one speed interval run, and one longish tempo run. 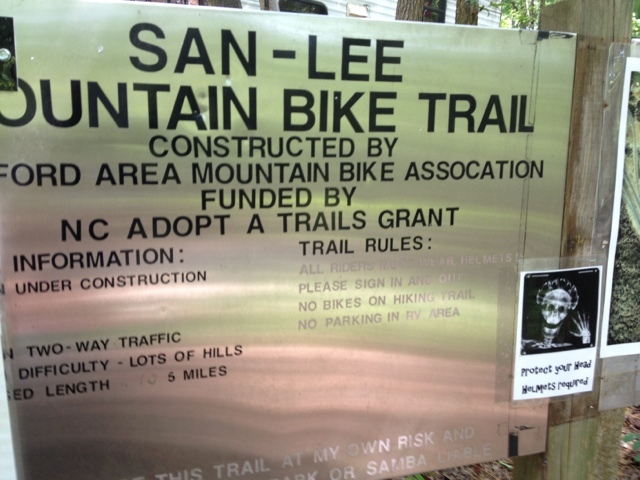 Today and yesterday were "rest days" for running but I still signed up for a mountain bike ride at San Lee Park. I was the only girl and pretty much rode by myself since there were some competitive (and fast) guys who were going at speeds of 8-10 mph. 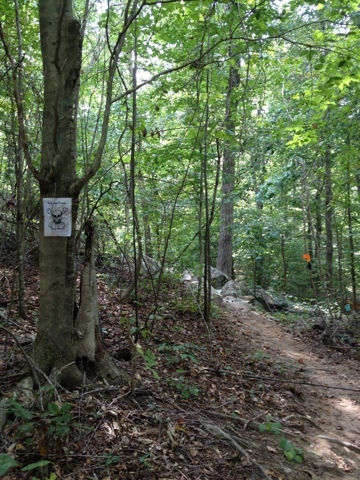 If you ever are lucky enough to go to San Lee Park in Sanford, NC, you'll understand that it is a challenge to go that fast on this rocky, technically difficult trail of 10 miles (plus a mile back and forth from the parking lot). I still had fun, I cleaned all the switchbacks except for one steep uphill one and tried two areas that I normally walk or take a bypass on (the Gauntlet and the Rock Nest Monster). 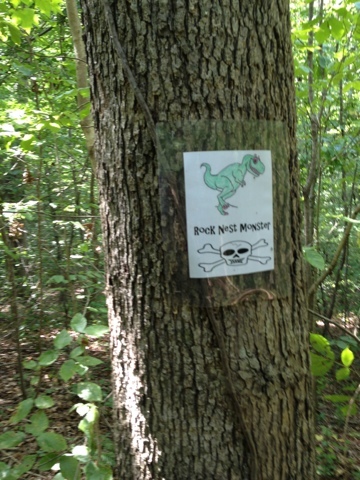 The Gauntlet is filled with baby-head size rocks that you maneuver on or through without breaking a derailleur and the Rock Nest Monster (picture below) is a nice piece of single track made up of rocks. I managed to clear 50% or more of both, then I dabbed (put my foot down) and started up again. 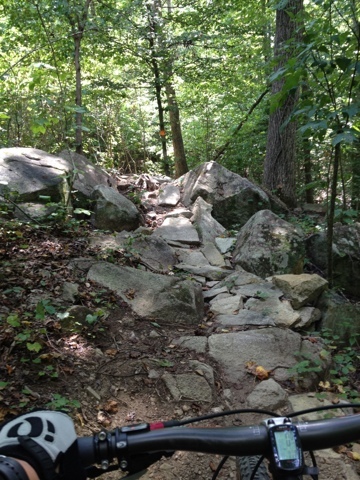 This is a great trail for intermediate to advanced bikers. There are not many steep uphills, it's very much about finesse and control. I did about 8 miles total in 1 hr 45 minutes. And it started to rain in the last half mile!